Hobby progress has been slow since the return from BOYL, with a combination of the usual disruptive effects of late summer/early autumn slowing down output. Slowing down output, but not halting progress. Behind the scenes I have been working on two projects. The first of these projects is assembling the Battle Systems sci-fi terrain that arrived about ten days ago. 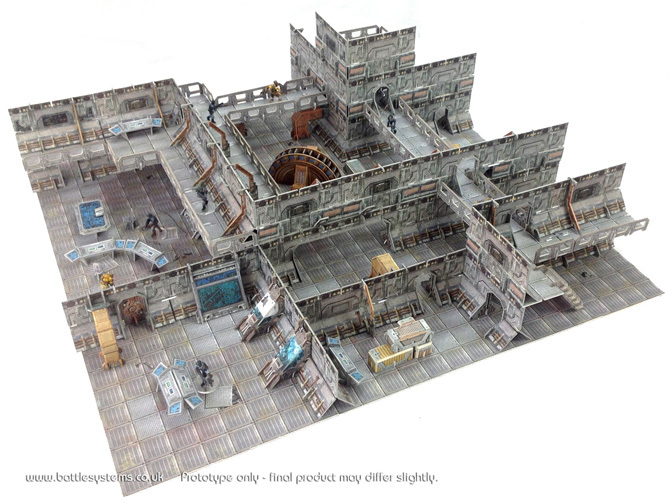 Its pre-printed, pre-cut sci-fi interior cardboard terrain. To date I have tended to avoid card terrain for my miniatures games – I prefer the more traditional, modular “train set” terrain sort of approach and mixing the two can be difficult to get right. Storage and time considerations had me resigned to my toy soldier interactions taking place in outdoor settings (a detailed sci-interior space is a huge commitment of resources) but then this Kickstarter came along and provided a one stop shop to fix it. Although assembly of this terrain takes about one hundredth of the time it would take to build in in any other fashion, putting the stuff together properly still takes significant time, so I dont have much to show for the hours that I have put in on it just yet. Some photos and some details of gaming plans using the terrain (things like VWFDXMPCOWPC, if that means anything to you) will follow at a later date. The other project is this WiP Ash Waste Nomad. As I have had a bit of burnout from painting orks in the run up to BOYL, I figured that I would get my small seven miniature strong Confrontation Ash Waste Nomad project done as a palette cleanser. The test piece model above is technically finished, but I have decided that I am not happy with a couple of the elements and that I want to revise them before I paint the rest of his buddies. So, while its a little quiet around here, there are a few things going on in the background that will come to fruition over the next few weeks, so stay tuned. Actually dont stay tuned, go to The Governor General of Sector Six blog where you can see Inquisitor Verhoeven, Gunslinger Rosa “Digger” Stone and Pat O’Blivion – Astropath attempt to get to the bottom of the evil machinations of the xeno-corrupted Ministorum in Sector Six (Texas actually, where some of my toy soldiers have gone on holiday for the sake of combined crossover narrative). Spot the tourists… click me. Suber, the short answer is that its good stuff. I will know better in a week or so and I am hopeful that I will get a game in on it within the next fortnight so I will report back then. I never had the patience or resources for PDFs of scenery to be printed and laminated and cut and glued etc, its very labour intensive, very precise work. I wouldnt touch that sort of thing. The Kickstarter Battle Systems stuff is a different beast altogether. I sound like a shill, but its a very different, honestly. If I was cutting and gluing then my set would look like crap too, but it doesnt: it looks like the promo. Ill put up a post about it over the next couple of weeks. I can imagine what you mean by dense card, and that is definitely a step up from printing and cutting and “fffffffuuuuuuuuu I’m already sick of this stuff”. The print it yourself stuff was a non starter for me too. The minimum requirements to get it to a decent standard are too high. Some people love it, but I found it a chore, with many obstacles between printing and playing. The preprinted and jig cut sets from the Kickstarter are great, but its still a fair amount of work to get it off the ground. Its like having a huge load of miniature flat pack Ikea furniture: its well designed and goes together nicely if you take the right precautions and do it properly, but it takes a while to complete no matter how you look at it. That scenery is tempting I have to say but what got most of my attention is the Ash waste nomad. He works fine for me and I particularly like the weathered pants. 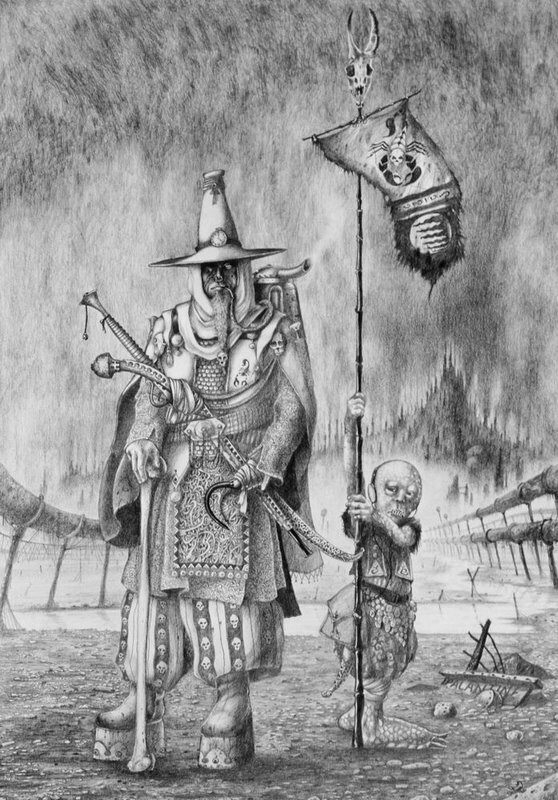 Though I suffer from post-BOYL lazyness I want to get bacjk on tracks with my RT/confrontation gangs and the nomads are one I’m looking forward to. Post BOYL burnout is a real phenomenon, its endemic on the blog scene. Pretty much everyone that I met at the event got as far as putting up a report or two when they came back and then ran out of steam. Its a natural thing after such a big build up, enthusiasm will come back. As for the Nomad, the scheme as shown is almost completely finished, I am just considering making the blue areas a little more blue, making the contrast between the highlights and the base colour a little less harsh. I expect to have the lot of them done over the next couple of weeks. That terrain looks fab, but can you tell me when it’s all made up does it take up much storages room when you’r not using it ? As for your nomad I think he looks first class & I look foreword to seen them all. The terrain breaks down into small wall sections and can then be clipped together. The clipped together pieces can be stored as sub-assemblies so that set-up for a planned game is faster, but its not a requirement. Check out the Battle Systems web page for an idea of the size of the basic pieces. They have a video on storage too that is very helpful. Im glad that you like the Nomad. I hope to get the rest done pretty soon. Thanks for the feedback. Your Nomad has me thinking of converting up a gang of them now, damn you! Another project! He does look all the cool though! 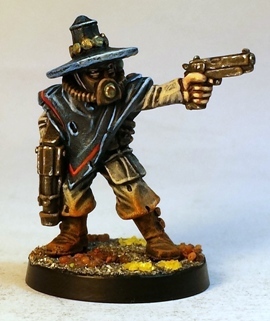 If the official Nomad models get finished and I enjoy painting them, I might paint a few of the Grenadier/Copplestone/EM4 Scavengers to add to the group, but its hard to compete with that cool wide brimmed hat look. The planets are clearly aligning – I am planning Ash Waste Nomads as my next project also…using the Marauder and Citadel figures too.